This species is a uniform reddish-chestnut color, including the underparts. The pelage tends to be coarse, and is especially long and often darker in populations from the mountains of East Africa. There is no dorsal stripe, although there is sometimes darkening on the nape of the neck. In some individuals (such as from coastal Republic of Congo) there may be a patch of black hairs on the shoulders. The legs are relatively long and are dark brown or black below the knees and hocks. The hooves are elongated. The tail is relatively long and black in color, with a tuft at the tip that may contain scattered white hairs. The face is uniformly colored as the body, except for a striking black blaze which runs from the nose to the base of the horns. The edges of this blaze are highlighted on the forehead by bright rufous eyebrow streaks. There is a well-developed crest of longer hair on the forehead which may be either black or predominantly red. Both sexes have short conical horns which grow 6.5-9.5 cm long in males, and 1.3-5.2 cm long in females. 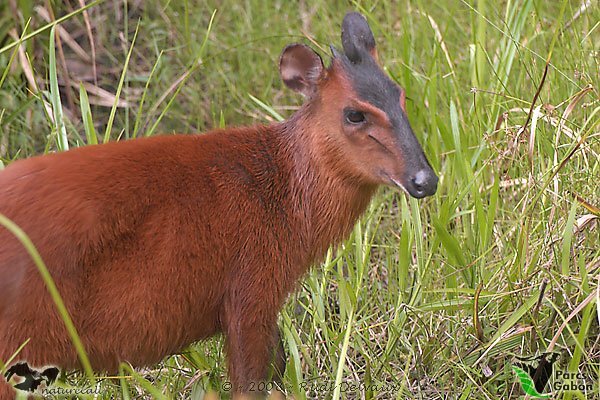 Harvey's duiker (Cephalophus harveyi) is very similar - both species have similar red coloration, a dark blaze on the face, and lack a dorsal stripe. 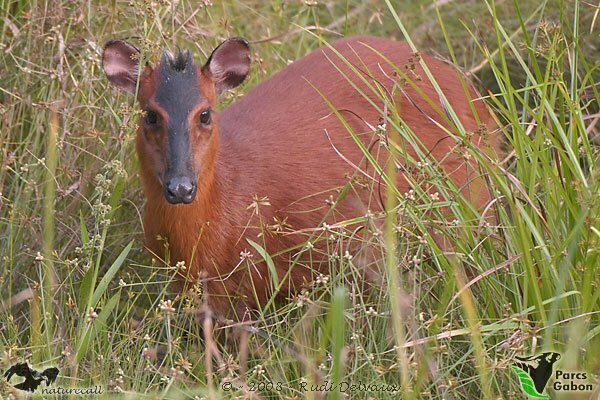 The black-fronted duiker lacks a striking white chin, has a dark tail, and has noticeably longer legs. Very little is known about the reproductive habits of this species. In the Central African Republic, preganant females have been observed in December, and lactating females have been noted in February and March. However, there is insufficient data to kow whether there is seasonality in the black-fronted duiker's breeding habits. 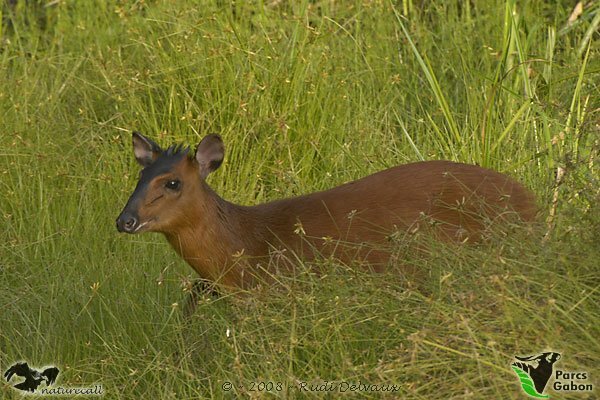 The black-fronted duiker is primarily diurnal, and is often seen foraging in open marshy meadows around dawn and dusk. This species consumed more foliage than other duikers in the region, and has been observed standing on its hind legs to feed on hanging lichens. Night is spent resting in thickets, typically on higher (drier) ground, and regularly-used paths run from low-lying foraging areas to favored resting spots. This species is well-adapted to swampy habitats, with spreading hooves and long legs; it can swim well, and its preference for inundated habitats may help reduce predation by leopards. If alarmed, individuals tend to flee in the direction of water. The alarm call is a loud whistle, and a loud thumping noise is often heard when this species runs - the source of which may be the large pouches in the groin (associated with inguinal glands). Black-fronted duikers are thought to be territorial, using dung middens and markings from the preorbital glands to delineate territorial boundaries. Population densities in the Ituri forest average 1.3-2.0 animals per km2, while in montane woodland habitats in Rwanda dominated by Hypericum there may be up to 21.6 animals per km2. Family group: Often lives in stable pairs. Diet: Fruits and seeds, foliage, mosses, lichens, fungi, and invertebrates. 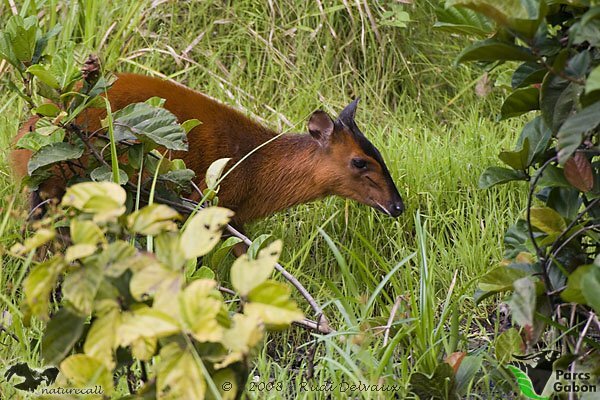 The black-fronted duiker inhabits primary forests throughout the Congo Basin, showing a preference for areas that are poorly-drained or marshy. In East Africa, this species is found in montane forests at elevations of 2,500-4,000 m. The approximate range is depicted in the map below. Based on population density estimates and the approximate area of occurence, the total population is estimated at 300,000 individuals. 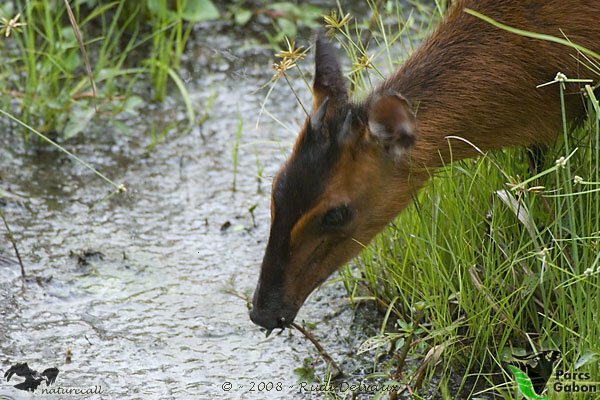 The black-fronted duiker's preference for marshy habitat reduces some hunting pressure, although its use of game trails increases its vulnerability to snaring.